Static and animated imagery of tropical disturbances, tropical cyclones and areas of interest. Users have the ability to overlay a variety of data on animated imagery loops of tropical storms. Atlantic Imagery | Pacific Imagery The eTRaP is a simple ensemble that allows for the generation of probabilistic forecasts of rainfall in addition to deterministic rainfall totals. ATCF Info|ATCF Format Description Subjective position estimates of tropical disturbances and cyclones across the globe using a variety of microwave sensors. Text bulletins disseminated by 0400Z, 1000Z, 1600Z, and 2200Z describing the position and intensity estimates for tropical disturbances and tropical cyclones in the Eastern and Southern Hemispheres. MTCSWA combines information from several data sources to create a mid-level wind analysis which is then adjusted to the surface. 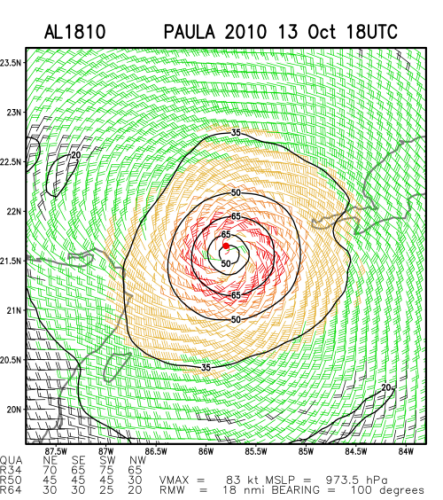 Eight products are displayed, most notably an inner core scale surface wind analysis. The Tropical Cyclone Formation Probability Product provides an estimate of the probability of tropical cyclone formation within the next 24to 48 hours in 1 by 1 degree latitude/longitude areas from 45S to 45N and 0 to 360E. The ADT provides an automated, objectively-derived estimate of the tropical cyclone location and intensity using the latest official forecast bulletins from the Joint Typhoon Warning Center (JTWC) and from Regional Specialized Meteorological Centers (RSMC), such as the National Hurricane Center (NHC) and the Central Pacific Hurricane Center (CPHC). The National Hurricane Center is the Regional Specialized Meteorological Center (RSMC) for the Atlantic Basin and is a resource for official tropical cyclone positions, intensities and forecast tracks. The Central Pacific Hurricane Center is the Regional Specialized Meteorological Center (RSMC) for the Central Pacific Basin and is a resource for official tropical cyclone positions, intensities and forecast tracks. Regional Specialized Meteorological Centers and Tropical Cyclone Warning Centers (RSMC/TWTC) provide official position, intensity and forecast tracks for tropical cyclones within their areas of resonsibility. The Brazil National Institute of Meteorology is responsible for issuing the official warning for tropical cyclones in the South Atlantic Basin. NOAA's Hydrometeorological Prediction Center provides visiting scientists meteorological training with an emphasis on the operational use and application of numerical model products.